The Compelled Educator: Digital Learning Day PD that teachers love! The teachers at my school are amazing. I'm inspired each day by what they are doing in their classrooms and out of their classrooms for students and each other. February is the month for Digital Learning Day, so we had our own teacher-led PD last week in celebration! Once per month, our teachers attend a "Collaborative Hour" (we're trying not to call it PD) or a staff meeting during one of their off periods. Most months are about literacy strategies as part of our school-wide literacy focus. In November, our collaborative hour was called "Teachers' Toolbox: Diversity, Equity, & Equality." This month, the focus was Digital Tools. All of our Collaborative Hours (PD) are teacher-led. 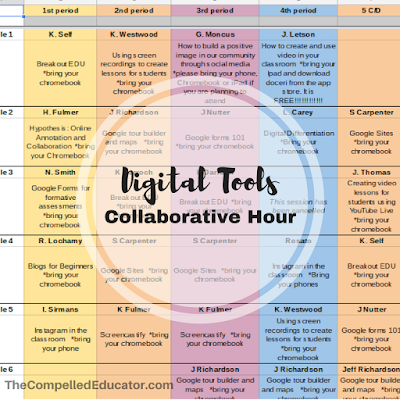 So when I was planning for February's Collaborative Hour, I emailed some teachers that I knew were using technology to do some cool things in their classrooms. I asked them if they would be willing to lead a session. IF you use a tool personally but not professionally yet, I am willing to help you and/or supply you with ideas on using it in the classroom. If you can show someone else how to use the tool itself, there will be opportunity within the session for the group to brainstorm ideas on how to use it in the classroom. The Collaborative Hour is about teachers DOING and not just hearing about a topic. For example, if you're teaching on snapchat, teachers who attend your small group would have to already have their snapchat account set up. For example, #booksnaps are one way to connect with kids on snapchat. There are many more ideas that I am happy to help you find if you need it. Part of the collaborative hour would be spent brainstorming ideas in the group of how it could be used in a teacher's classroom - either their own or someone else in the group. --I would like to have 6 teachers per period to offer small group sessions. This will give us no more than 6-7 members in each group. --The teaching staff will get the "menu" of options by February 2, so that they will know what is offered during each period so that they can choose which one they want to attend. If you know of someone else I could reach out to, please share their name so that I can put them on the waiting list to see if we need help in any of the periods. All of you rock! Thank you for what you do! Most teachers accepted, and some even stepped outside their comfort zone to lead a session. I am so proud of them! I asked them to let me know which period(s) they could lead a session and what their topic would be. I started plugging their names and session titles into the schedule, which was a shared Google Sheet. I also gave them editing rights to the Google Doc, in case they wanted to tweak their session title. I then asked Keith, one of our incredible tech coaches to see if some of the tech coaches from the other schools in our district would be able to fill in the "holes" in the schedule. They came through like champs! We had a full schedule, and we were ready to go! I emailed the schedule to the staff the week before the date of the Collaborative Hour so that they could take a look at the sessions that were being offered and which periods they were being offered. To help teachers navigate when they got to the library, I created "table schedules" that the librarians put in acrylic holders for us. A person could look on the table schedule and see the different sessions that were being offered at that table throughout the day. I also provided a few hard copies of the schedule by the sign-in sheets. I didn't want anyone to waste time trying to find their session. And of course, I provided chocolate! The day went great! Lots of laughing and talking and trying new technology tools. I can't wait to see how our teachers use what they've learned! 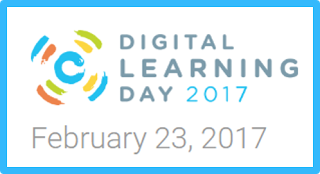 What do you have planned for Digital Learning Day?